A Center of Excellence (CoE) coordinates care for individuals that are insured by Medicaid and have an Opioid Use Disorder. Under the CoE, treatment is team based and focuses on the "whole person" with the explicit goal of integrating behavioral health with primary care. 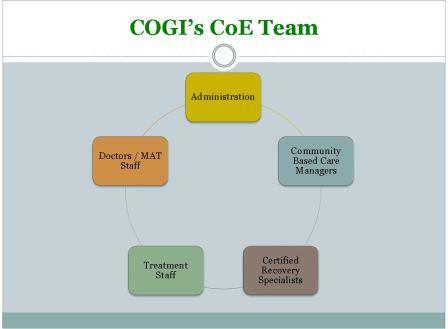 Described as a "hub and spoke" model, COGI established what it is believed to be Schuylkill County's stakeholders in the fight against the Opioid Epidemic. The COGI model pictured to the left defines the stakeholders COGI has identified. COGI's Center of Excellence Team compliments are existing Treatment Staff. With a Center of Excellence designation, we are able to enhance our services by implementing Community Based Staff. Click on the "Meet Our Team" button below for personal contact information for our Community Based Team.